Our range of products include accutrol weight bridge. Quick & Frequent Accuracy checks on your Weigh Bridge for YOUR Peace of Mind. Trolley safely towable by most tractors/cranes etc. 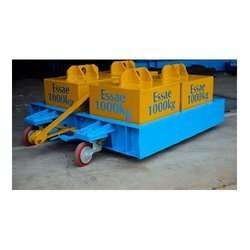 Easy to pull trolley with predetermined weight displayed. Ackermann steering for easy manoeuvrability over the platform. Spring loaded High Density Poly Urethane wheels to travel on any terrain. Standard weight approved by Regional Reference Standard Laboratory (RRSL) Department of Consumer Affairs, calibration certificate will be provided for each weight. Steering Lock mechanism for ease of reverse straight movement. Looking for Accutrol weight bridges ?